Detroit's Kris Draper is third among all NHL players in face offs percentage. The Detroit Red Wings haven't won a Stanley Cup since 2002, which must mean they've been an utter disappointment ever since. Yeah, and everything is all right on the housing mortgage front, too. Maybe the Red Wings have been disappointed in themselves during the past four seasons because they haven't found a way to re-create their previous postseason magic; but to call them a disappointment would be a great injustice, and simply wrong. No NHL team has won more games (252) or recorded more points (558) since the Red Wings last won the Stanley Cup. These aren't disappointing figures. These are staggering figures. Sure, in that same time frame the Wings lost in the first round twice and the second round once, but when the playoffs begin again on April 9, Detroit will likely be in a familiar position -- right on top of the Western Conference with the world wondering if this is the year Hockeytown bares its teeth again. "We have had unbelievable hockey players and great chemistry and character in our locker room," said veteran Kris Draper, a three-time Cup winner. "After the lockout everyone said, 'How will Detroit respond to this?' With the salary cap coming in a lot of people thought we would struggle, but we stayed at a high level and put ourselves in position to compete for the Stanley Cup. It's why I enjoy being part of the Red Wings. When you come to camp, you have an opportunity to compete for the Stanley Cup." That's not hyperbole coming from Draper, either. Every season since 1991, the Red Wings have made the playoffs. That's a run of 17 years, the longest active streak in professional sports. How does Detroit stay so consistent? Take your pick. Current Detroit Red Wing players discuss what it takes to win back-to-back Stanley Cups. Ken Holland is in his 11th season as the team's general manager and 25th in the organization. Jim Devellano, the senior vice president, hired Holland. Assistant General Manager Jim Nill has been in his position for 10 seasons and in the organization for 14. Draper, Nicklas Lidstrom, Tomas Holmstrom, Kirk Maltby, Darren McCarty and Chris Osgood played on Detroit's back-to-back Cup championship teams in 1997 and 1998. Chris Chelios, Pavel Datsyuk and Dominik Hasek joined the cast for the 2002 run. "Players want to play here," Lidstrom said. "I'm certainly one of them." Lidstrom has the hardware to prove he's been the best defenseman in the game during the past decade. And future Hall of Famers Steve Yzerman, Brendan Shanahan, Sergei Fedorov and Brett Hull have since given way to Datsyuk, Henrik Zetterberg, Valtteri Filppula, Dan Cleary, Johan Franzen and Niklas Kronvall among others. Datsyuk and Zetterberg have especially become the new faces of this franchise. "They have really developed into star players in our League," Lidstrom said. "And, now we have other young players that are getting a chance to play, too." Hakan Andersson, the team's chief European scout, has done wonders for the Red Wings, leading to the successful – and somewhat lucky – drafting done by Holland, Nill and their staff. 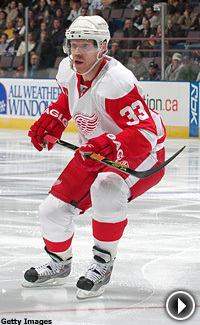 The Wings nabbed Datsyuk in the sixth round (1998) and Zetterberg in the seventh (1999). "Datsyuk came in as a third-line center in '01-02, and has worked his way to where he's at in the League today," Holland said. "But, we also had luck. If we had to draft again, they'd both be in the first round." This season, Holland also sprinkled in a key free-agent signing (Brian Rafalski) and one trade-deadline acquisition (Brad Stuart) to bolster the defense, and Detroit has been the odds-on favorite to win the Cup ever since it ripped off a 10-2-1 run in October. "There are factors that go into why you do win and why you don't win," Holland said. "My feeling is keep putting a good team on the ice, keep knocking on the door and hope that one year everything goes right and you knock it down." The Wings may knock that door down this season, but even they're not immune to adversity. Beginning with a 5-3 loss to Los Angeles on Feb. 7, the Red Wings went into a 1-8-2 tailspin due in large part to a rash of injuries to Lidstrom, Rafalski, Chelios, Kronvall and Cleary, who is still nursing his broken jaw. "The interesting thing is until 50 games, we pretty well had our way," Draper said. "We were winning games we didn't deserve to win, but we found a way late with a goal or our goalie would steal a game. Sooner or later, it will catch up to you." Detroit's lead in the Western Conference shrunk from 17 points at the All-Star break to three points atop Dallas by the end of February. It's only at five better San Jose right now (102-97) despite Detroit's current 6-2 record in March. However, the slump, once a thorn in the Red Wings side, could now prove to be the best thing to ever happen to them. Instead of cruising down the stretch run of the regular season having left all the other horses in their dust, the Red Wings are running toward the finish line, trying to fend off the competition along the way. They're in playoff mode now, when in past year's they would be resting players. Lidstrom and Draper, teammates for more than a decade, know that ratcheting up the intensity now will pay big dividends once the tournament begins. "By having a good regular season, or winning the President's Trophy, doesn't mean anything when the playoffs start," Draper said. "If you're a one, two or three seed, those teams you're going to play have been battling for a month to get into the playoffs."